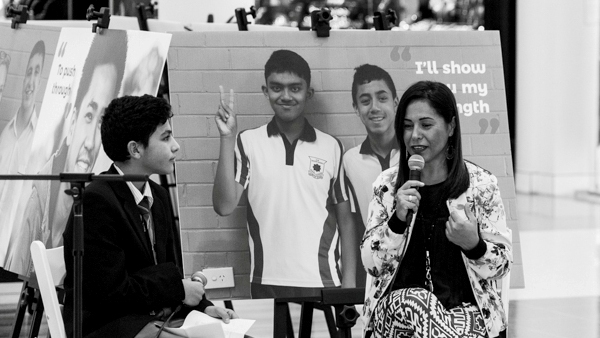 Migrating to Australia from Turkey at a young age, Turkan Aksoy struggled to deal with gender expectations, dyslexia, self-doubt, and the difficulty of finding your place when caught between two cultures. Today, she wants to help young women in Australia find the courage to be themselves in a world where they feel misunderstood. I was born about 45 years ago in Ankara, Turkey. Can you please describe the place you spent your childhood?. I grew up in Ankara until I was about seven, and then my parents came to Australia as workers; so I grew up in Homebush. Can you please describe one significant memory from your childhood? Something that I remember vividly is snow. In Ankara there’s a lot of snow, and I was very young going to school – I was a very little person. I’d get lost in the snow. So I’d put one foot down and I wouldn’t be able to put the second foot down; my brother would have to drag me to school sometimes. That was quite vivid. And we were very poor, so my mum would give us socks to put on our hands as gloves. But by the time we got to school they were soaking wet. So, it was not very useful. Do you see any similarities between Ankara and Sydney? I don’t know if there are similarities, because I have very few memories of Ankara. I think the migration process actually traumatised me [and that’s why] I block off a lot of the time I had in Turkey; so I can’t really compare. But having gone back 10 years ago, Ankara is not very green. There’s a lot of concrete, a lot of units, a lot of roads; so you don’t really have a lot of green space. Whereas in Australia, you have a lot of those parks and trees and lovely green space – for now. Is there a smell, taste or image that takes you back to your childhood? Can you please describe that for me? What about any smells or tastes from your childhood? I honestly don’t have any smells or tastes or memories of Turkey. I just remember being – because we used to have school the first half of the day, and then there would be school the second half of the day. You weren’t at school all day, you were at school half the day. I know it sounds bizarre. So you would be at school from say, 9 o’clock to 11:30, and then the afternoon kids would start from 12:30 to 2:30. So primary school was broken up in that way. I’m not sure what we did in the afternoons when we came home, I have literally no memory. I live in Auburn. After we moved from Homebush; which [when we first] flew in here we stayed in Homebush. And then we moved to Auburn, and from Auburn I moved to Lidcombe, and then from Lidcombe I moved to the Eastern Suburbs because I used to work there; and then I came back 3-4 years later to live in the Auburn area. Now I permanently live in Auburn. How old were you when you came to Australia from Turkey? I’ve been back 10 years ago, and having that massive gap from being 7 to being in your 30s, almost 40s, it was a huge gap. Because everything that I remembered – the little that I did remember – it couldn’t somehow fit into my adult memory. So when I went there my mum pointed out where our house was, and two dogs now live in that house. So I’m like, “Yeah mum, I remember being poor. I don’t remember being that poor”. But yeah, we were very poor. Yes it does. Again, I don’t believe home is a place, it’s people. So whoever I’m around and the connections I have, it wouldn’t matter if I was on the moon. What dreams did you have for your future when you were younger? How achievable did you feel these dreams were, and what dreams do you have for your future now? I had very little dreams about my future as a child. In high school, I kind of wanted to leave in Year 9 and then try to get a job at Franklin’s, which is like your Woolworths or your Coles. I would’ve been super happy, and that was because I was dyslexic and I couldn’t read. So I didn’t feel I was very intelligent, and the options of going to university or higher education was not really valid for me. How did you battle with dyslexia? It didn’t get diagnosed until I was in Year 10, which is quite late in the game. And then once it was diagnosed through the Education Department, there wasn’t any support given to me. So I was very confused when they sort of labelled me with this disorder. The whole time I just thought I was dumb, I couldn’t read; my siblings who were much younger than me could read. But the way I overcame it was, I had a friend – my best friend was, like, a super high-achiever. She would be able to ‘speed-read’. So she would ‘speed-read’ a book, tell me what the themes and the characters were, and then I’d be able to relay that back in my class. And then through that support I got from her, I was like… I kind of forget that it wasn’t because I was dumb, it was because of some learning problem. And I spent one of my summer holidays forcing my younger siblings to sit down and help me memorise the dictionary from A to Z. So they would read the word, I would visually look at it, they’d explain to me what the word meant, and I’d take a little photograph in my brain. So now when I see the word I’m able to just recite it, like if I was to see an apple or car or baboon or colour. It must have taken a lot of strength to overcome dyslexia. So, what does strength mean to you? Strength for me is knowing what your capabilities are, and always testing yourself. You’re never gonna know your strengths if you stay in your comfort zone. So if you just sit there and go, “This is what I can do and that’s it” – how do you know you can’t do more? So it’s always about trying to go past those barriers, and go past those limitations, to see what other resources you can pull out of you. And also knowing when to ask for help. I think that’s a huge strength many of us fail [to do]. Not because we’re not strong, but because we don’t seek help and we don’t ask questions. I think that when you need help, it’s okay to turn around and say, “I don’t understand this, or I don’t know where to go for that, can you please advise or can you please support me on this?” I think that creating that network – because no legend, from Muhammad Ali to Gandhi, ever achieved what they did just on their own. You know, they had wives and partners and friends and support along the way that supported that greatness, and I think that we need to be very mindful of that. That not one person achieves all this greatness; it’s a network that you create for yourself that keeps pushing you and supporting you when you do fail, so that way you can keep going. You migrated from Turkey, you had dyslexia, but you went to a school in Auburn. Did you feel like much of an outsider being a migrant and having a disorder? Absolutely. Being a migrant alone is quite a big issue anyway; like, I remember going to Auburn and my teachers couldn’t pronounce my name properly. They’d say “Toucan”, or they’d spell it all wrong, and I’m like, “How hard could my name be?” Like, – do you know what I mean – they couldn’t get it right. Then they wouldn’t get my surname right, and they would call me “Axel” and I’m like, “Who the hell is Axel? This is not 48 Hours”. So it was quite bizarre that people could just be comfortable and okay with just getting someone’s name incorrect. I’m like, “That’s so disrespectful. Even though I’m a child, you have to show respect to gain respect back”. I think it’s really important that you ask somebody, “What do you want to be known by and how do I pronounce that?” If I can say “Gwyneth”, they can say “Turkan”. It’s not that hard. True, very true. What is the hardest thing you’ve had to overcome? Besides dyslexia, which has been something I have lived with my whole life – and still live with today, because there are words that I’ve never seen before that I might have to look at and go “I don’t know how to – what does this one mean?” It doesn’t happen often now, but it did happen sometimes. Besides that, I also lived with a father who was quite domineering and controlling. So when I was a child and I said “Dad, I want to become a jet pilot.”, my dad was like “No, you’re not going to become a jet pilot. You’re going to learn how to cook, and clean, and raise children, and look after a house”. So even as a child I was told what a woman could do and what her limitations were. That was a challenge for me. I bypassed the challenges all the way with my father, even though he was like “No, no, no”. I kept pushing those boundaries and limitations that he had placed. For example, I moved out of home when I was 27, and my parents – particularly [my father] – didn’t talk to me for almost a year. And that’s hard for a young girl, to break out and try and say “I’m going to stand on my own two feet as a woman”, and then your family ostracises you for that. But yet, I did it. My older brother didn’t do it, he had all the freedom in the world and he was too scared to push that limitation. But I was like, “No, if I do it, then my sister [and] my younger brother can do this as well”. So breaking barriers is what young people should be doing. Where do you think that your parents – your father – learned these, so to say, these traditional morals? Where did he learn them you think? How did you turn that experience – your father’s overbearingness – how did you turn that into a personal strength? You know, look, I got very angry with my father for a long time. In my teenage years – I know this is going to sound horrible, but – I used to wish that he would get hit by a bus. And hopefully my mum would survive, but he would pass on and I wouldn’t have to worry about him. But that was very much out of anger. In my 30s, I actually put my dad in a car and we drove to Queensland. So nine hours in a car where he couldn’t get out; I had all the time in the world to ask whatever questions I wanted – and we did that. So we jumped in a car in Sydney, drove all the way up to the Sunshine Coast, yet talking the whole time. And because we had so [many] of those hours together, I was able to break down some of his walls, and I found out a really terrible and sad story that he had never told us, ever. My father was crippled; he had hip dysplasia, which makes it very hard to walk and is very painful. Him and his older brother, Musafir, were sick. They both had a flu or virus or some horrible disease at the time, and in those days you didn’t have antibiotics and doctors nearby. So my father heard his father say to their mother, “If any of these guys are gonna die – as in [his] children – it better be… my dad”, because he was the one who was crippled. But in the morning, my great uncle passed away. So his brother died that very next day, and hearing this story blew my mind, thinking, “Here is a young boy – he would’ve been 7-8 years old, and his brother would have been about 10-11 – [his brother] passed away in the same bed that they shared”. That would have been a very, very traumatic experience to know that he has a disability and [that] the world is not going to be very accepting of that. So he grew up [with] so many obstacles, especially in his era, that allowed me to connect to [his] strength. Even though I had hated him because he was so angry all the time, I understood him, because of some of the things that had happened to him. So if I had known some of these things, these histories, these stories when I was younger, it would’ve helped me understand him a lot better, and not be so angry, and be open to listening some of the stories he had. Whether it was painful or happy, it was stories that I could learn from. So that was quite a massive learning curve for us as daughter and father, and since that day our relationship has been so much stronger and so much more supportive than ever before, and it took a massive road trip to do that. Well, you work in a very multicultural area, wouldn’t you say? And you’re the multicultural officer for the council that you live in. Do you see many parents, even today, going through similar things like your father? Like, they experience things but they aren’t able to convey it. Yeah, like some of the issues I had to face when I was 15, girls in that age bracket are still facing today. I’m like, “Why, after so many years, do we still have the same issues?” I think that sometimes what we fail to understand is that when people migrate to Australia, they have a very fossilised experience. The migration experience can be very traumatising. So parents come here, or they raise their kids in Australia, and they’re stuck with dual cultures. So they have a culture in the home that they’re trying to keep – culture, language, the way they eat, the music they listen to, and all that – alive. But then there’s the Western Culture. As soon as they walk out that door, these young people go to schools and they’re being taught a whole different narrative; and they are going back and forth on a daily basis going, “Which one am I meant to be taking on board?”, and it can be very confusing for young people. And it can be very hard for parents to go, “How can I give this young person some space, but also make sure they’re not lost? We don’t want them to not be able to speak Arabic, or we don’t want them to be able to not understand their own culture and customs that they’re going to have to grow up in”. But yet, they’re also being told, “You have freedoms, your parents can’t hit you, and you’ve got financial support, and you’ve got mental health support, and this and that”. It sometimes can cause a bit of a wedge between the child and the parent, because [there are] very clashing stories. So this clash between Western Values and Eastern Values, how did you deal with it as a young girl, as a teenager? I don’t think I did deal with it. For me it became… I had a different persona. So I had a persona in the home – I would be washing the dishes and watching my Turkish videos and eating my baklava – but then at school I would be this young, very liberal, alternative person. But then I would come back home and still be that young girl who washes the dishes, and does the vacuuming, and shows respect to her parents. But then, I would go back to the school and talk about female rights and the economy. So it was a bit hard to create this whole new persona of who you are, and it’s hard to kind of reconcile [the two]. To go, “Am I [this] or am I that, or am I a bit of both?”, and it’s a constant challenge to be able to go, “Where do I fit, and what are my values?” Because my values are not that. I don’t believe in forced marriages, I don’t believe in certain things like state and religion being together, I don’t believe that women can’t get jobs and men can. I think that it’s very [important] that they work towards equality and access to all sorts of resources, including employment. What about when you finally entered the workforce? How did you cope with the overbearingness of your parents? Once I started working, it changed the power. So I didn’t rely on them for financial support any longer; and when you have more money coming to you, you can buy your own car, you can study what you want, you can live where you want. So I think having that financial independence allowed me to step up a lot more towards my parents and say, “Hey, that’s not okay”. I think that was a bit of a struggle, and now they’re completely supportive of what I do. Yes it took almost 10 years, but they’re very much more understanding, and they give more attention to my children when they’re growing up now. And my dad will say [to my kids], “You can be whatever you want”, and I’m like, “Hold on, what about me? You weren’t saying that to me when I was a child”. It’s lovely that they’ve taken that turn and they’ve woken up; and they do their own study now. My dad’s on Facebook, on Google, you know – he [translates it] and is good to go – I love that stuff! And my mum is constantly learning, she’ll go on Turkish Programs and sit me down and tell me, “Psychologists say…”, and I’m like, “What!” So it’s lovely to see their development as well. The biggest quality that I love about myself is that I’m a Forever Student. I’m very eager to learn, and [after] every experience I have with the different people I interact with, I try to walk away [thinking] “What have I learned from this?”, and hopefully teach others as well. So I love [the] relationship that I have with whoever I have encounters with. Not to worry too much, and to have more confidence and believe in myself. Because I think I spent way too many years in Years 7 and 8 and 9 going, “I need to leave school because [I’m not] good enough to go to University”. I’d tell myself, “Look, you’ve surpassed your expectations of working for Coles, you now work for a local government, working on projects that support young people and old people alike, from a diverse background, and you’re making change in the world, so be proud of that”. What does freedom mean to you? How do you express this freedom? Freedom means being yourself, and you’ll be surprised how many people are not themselves, or don’t feel comfortable [enough] to be themselves. I think that’s true freedom, when you can surround yourself with people who accept you for who you are and what you are, and what you have to offer the world. Have you ever been in a situation where you had a lack of freedom? I would say, as called members of our community, we always have limitations. What we talk about – things like racism – that’s real. I know that’s real in my life and in my experiences; I have applied for jobs in certain areas, and because they see my name and what suburb I live in, they judge. I’ve seen that in first [hand] accounts, and I’ve done trials where I would give the same resume out with Jan instead of Turkan, and the response is completely different. And that’s quite sad to see, that there’s a world out there that judges you. But instead of being stuck in that place, where “Oh wow, it’s so bad”, you have to learn and adapt, to work out how you can bypass that. So now when I do my new Step Up workshops for people who are trying to look for jobs, I’ll say to them, “So, your name’s Mohamed and your name’s Jim. Okay Mohamed, what I need for you to do is call up the organisation you’re applying for, and get them to hear your voice and make sure they know that you’re very interested in this position. So when they get the resumes, they’re going to know who is the hard, more interested worker.” So we try to use those bad experiences and flip them, and make them into good experiences so they can have better outcomes. What advice can you share with others who may be going through similar experiences as those you had to overcome, and how can you help others recognise their inner strength? I think sometimes when you’re in a bad situation, you feel like that bad situation is never going to go away. You feel very stuck, and you feel very alone. I think those are some of the key things that come out for anybody, whether it’s depression, anxiety, stress, or [if] they’re going through grief. I think what works really well is asking for help, and when you go to get the help, to be able to express yourself. [To say], “This is how I’m feeling right now”. Unless we give safe spaces for people to express what they’re going through, they’re not going to move forward. So making sure that they’re connected to the right services and referral pathways, and they’ve got the right person to support them through the right ordeal or issue. When would you say your parents finally realised that you are this person, you are this person that is free, liberal, you like to express yourself? It would probably be when I went onto the Big Brother house. Back in 2002, I applied to go on a national TV program and I was the first Turkish girl to ever be selected. Yeah, it was very funny. My mother had a bit of a chat with me, like you know, “Make sure you don’t do anything stupid that we can be ashamed of”. And my dad had the same chat with me and said, “Do whatever you like, I’m supporting you 110%”. So it was very weird to hear both of them having completely different versions of what I should do. But when I did go in the house, I was very much myself, and I think for the first time in my parents’ life they were able to see what I was up to [for] every minute of the day. Because there’s cameras – like 51 cameras – in the house. So they could literally go online and [see], “What’s Turkan doing right now?” So [there was] no hiding; any conversation I had, any interaction I had, I had to be okay with the fact that everyone was seeing this, and I had to just back myself up and go, “Yep, this is what I’m like”. And that was a very good experience, because there’s no hiding, there was nowhere to hide… Even in the toilets there were cameras.